One of the blogs I've been visiting for a while is published by an L.A. turned N.Y.C. girl who does so many cool, creative things throughout each day I honestly don't know how she has the time to jot it all down, complete with pics of her looking incredibly chic while doing it all. Just to put things in perspective, she models (that's her in those Free People catalogues), designs shoes and booties for a line she runs with her sister, fellow blogger Dylana Suarez, and also records music. Not surprisingly I'm a fan of her style, which is always some kind of casual with unexpected elements and often has a 70s rock and roll vibe going on. 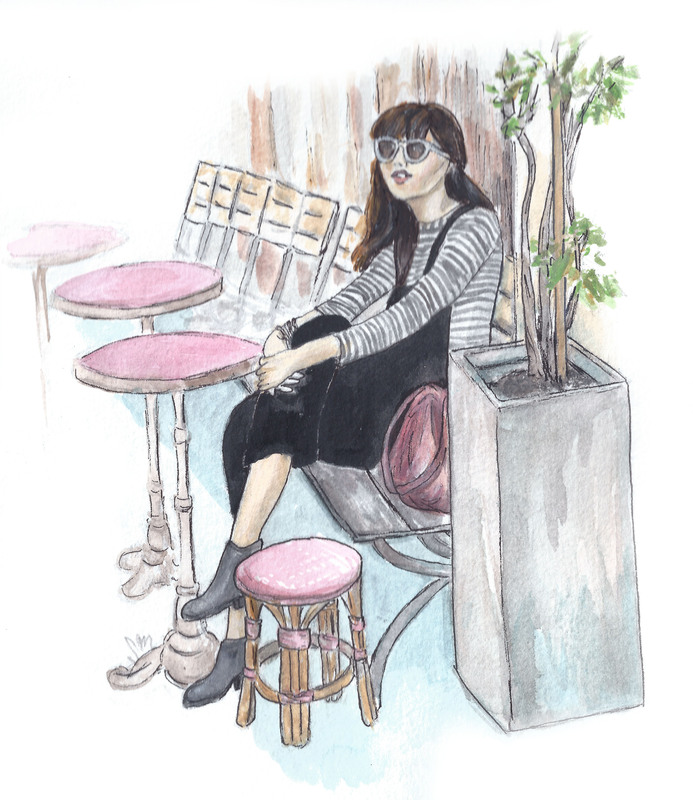 For this illustration, I was inspired by a post in which she was wearing a striped top and velvet overalls on a recent trip to Paris. “So so simple and easy,” she blogged about the outfit at the time. Easy perhaps and comfy too, but still it manages to capture the romance of the city. Besides, how could any American girl resist the urge to don stripes in gay Paree? Anyway, if you want to check out her adventures, her blog is called Natalie Off Duty.